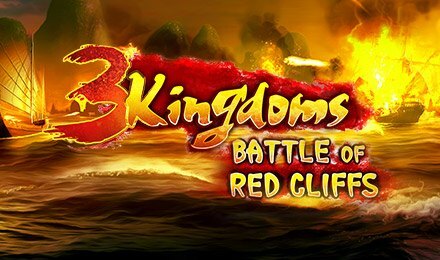 3 Kingdoms Battle of Red Cliffs is a 5 reels and 25 paylines slot game developed by Pragmatic Play. This historical Chinese themed game allows you to benefit from free spins and wild options! In this slot game, you’ll be surrounded by three warriors, a seascape backdrop and crashing waves. The design of the slot game takes you back to the Ancient dynasty, where you have to fight to be rewarded. On the reels of this slot game, you’re bound to discover various symbols like Cao Cao, Liu Bei, Sun Quan, Swords, Helmets, Ships and low value symbols A, K, Q, J, 10 and 9. These are the symbols that will land in winning combinations on your slot grid to award big wins. The three warriors are the most rewarding symbols, and award 200 coins per payline. Get familiar with the various options on the screen to help organise your gameplay on 3 Kingdoms Battle of Red Cliffs. Click on the – or + buttons to set your bet levels and coin values. Also, you have the Autoplay button, that allows you to set your spins to auto from between 10, 20, 30, 50, 70, 100, 500 and 1,000 spins. Bet Levels: Select bet levels between 1 – 10. Amount of Paylines Selection: All 25 paylines are fixed and cannot be adjusted. Coin Values: Select coin values ranging from £0.01, 30.03, £0.05, £0.10, £0.20 and £0.50. The Wild symbol is the Royal Banner which replaces for all symbols except the scatter. When it lands on reels 1, 3 and 5 simultaneously, it triggers the bonus round of the game. Vanity: 20 Free Spins. The red warrior acts as wilds when it lands on reels 2, 3, 4 and 5. Intrigue: 10 Free Spins. The red and green warriors are wild throughout. All Out of War: 5 Free Spins. Red, green and blue warriors are wild on reels 2, 3, 4 and 5 on every free spin. Spoils of War Progressive Jackpot Feature:Every time you land a win spin that features a warrior in the base game, you’re awarded one point closer to the jackpot feature. This is triggered once you have accumulated 40 points. A selection of envelopes are then presented to you, and you have to choose one to reveal a cash prize of either 2x, 4x, 6x, 8x, 10x, 20x, 50x, or 100x. Enjoy battling for your wins at Moon Games Casino on 3 Kingdoms Battle of Red Cliffs slots. Take a virtual trip to Ancient China and see what they have in store for you.